George Merrick realized his dream of a "great hotel" in the City of Coral Gables that would be the resting place and playground of the rich and the famous in 1926. 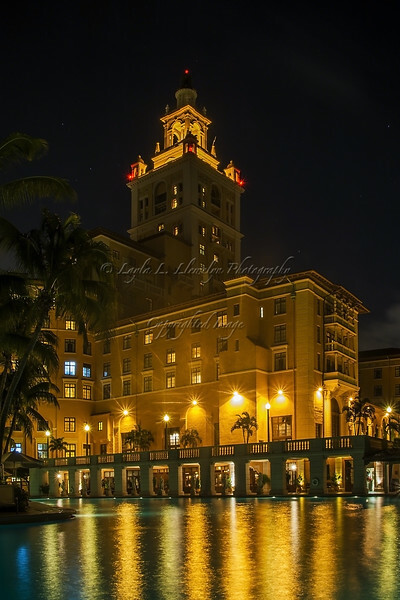 At the time of it's opening, the Coral Gables Biltmore Hotel was the tallest building in Florida. It has a long and rich history, including a period of time where it served as the Army Air Forces Regional Hospital during World War II, a couple of closures and a couple of renovations/revivals. In 1996 it was designated a National Historic Landmark. The pool featured in this photo is claimed to be the largest in the continental United States.